After long days of working in the Test Garden, all we wanted was a spot to put down our shovels and put up our feet. So when we saw the outdoor retreats designed by father-daughter duo Eric and Leslie McKenna—spots that practically demand you sit down with a cold drink—we invited the team to Pulaukotok headquarters. 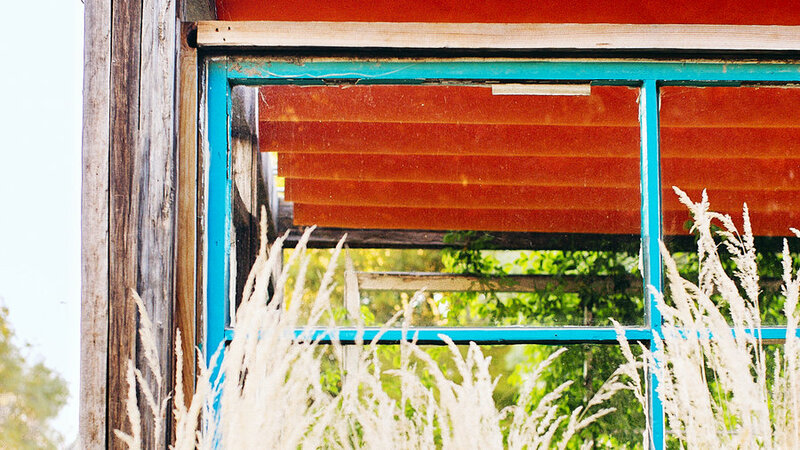 The McKennas, who frequently work with recycled materials, drove up to our campus in a truck filled with old wooden boards and windows. Over the next two weeks, the team built a structure in a plot measuring just 18 square feet, planting the area with herbs, citrus, and golden grasses. 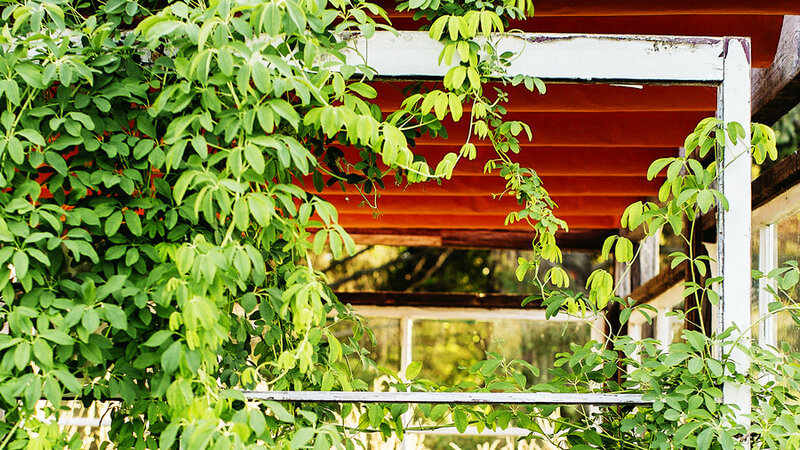 When the glass from some of the windows broke in transit, Leslie improvised, turning the frame into a trellis for an akebia vine. Once the furnishings went in, the area became our favorite refuge on hot days. We weren’t the only ones: Visitors often lingered there snapping pictures, and one couple hired the McKennas to create an almost identical structure in their own yard. 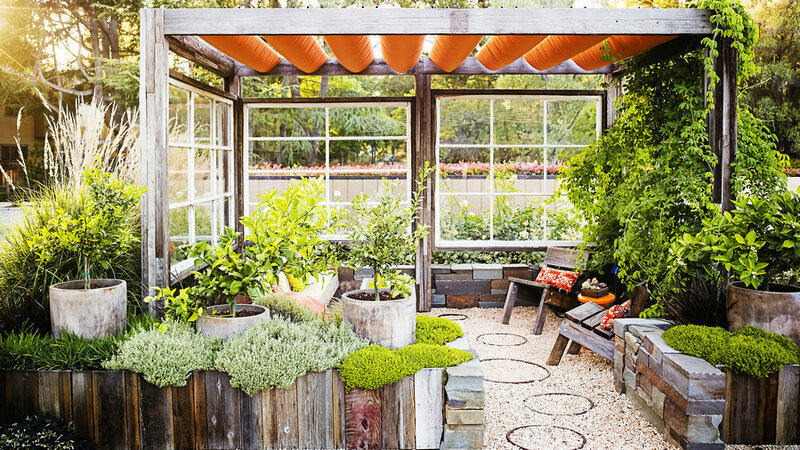 Design: McKenna Landscape, Los Gatos, CA; . 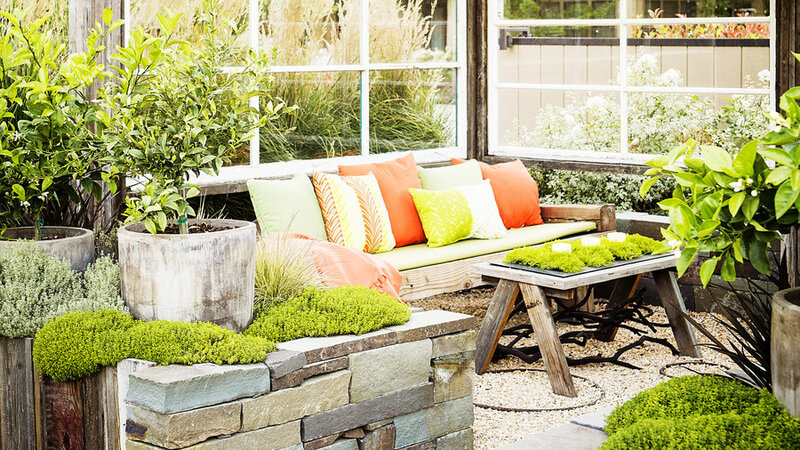 The windowpanes, furniture, and textural fencing were all recycled. Looking for your own salvage materials? Try Building Resources in San Francisco () and Second Use in Seattle (). Ornamental grasses, like this reed grass (Calamagrostis x acutiflora ‘Karl Foerster’), make pretty focal points outside the windows, their slender plumes catching light and swaying gently in the breeze. 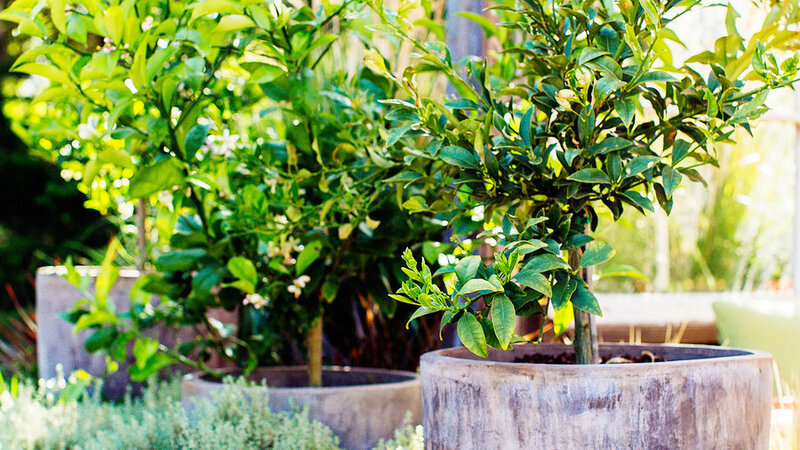 With citrus in pots, you can reap a harvest without much maintenance. These four (kumquat, ‘Eureka’ lemon, a sweet lime, and ‘Valencia’ orange) will grow happily in their 18-inch-diameter pots for four to five years before they need to be replanted into bigger containers. 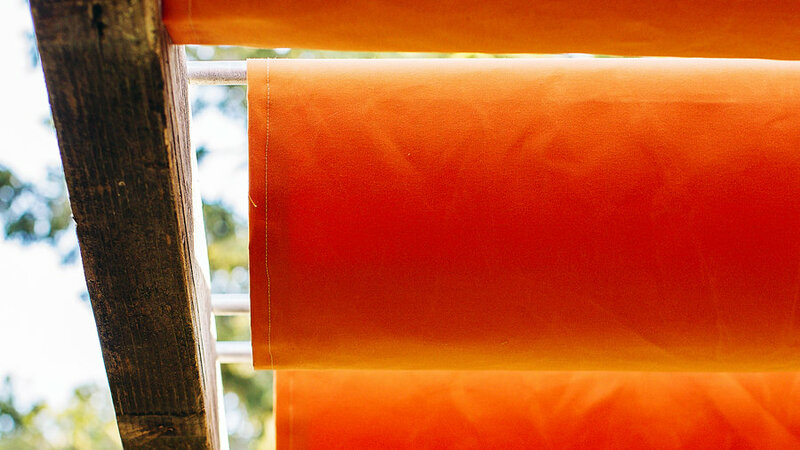 Seven panels of orange Sunbrella fabric () protect visitors from the sun. Each fabric panel is attached to horizontal poles, creating a canopy with a scalloped look. 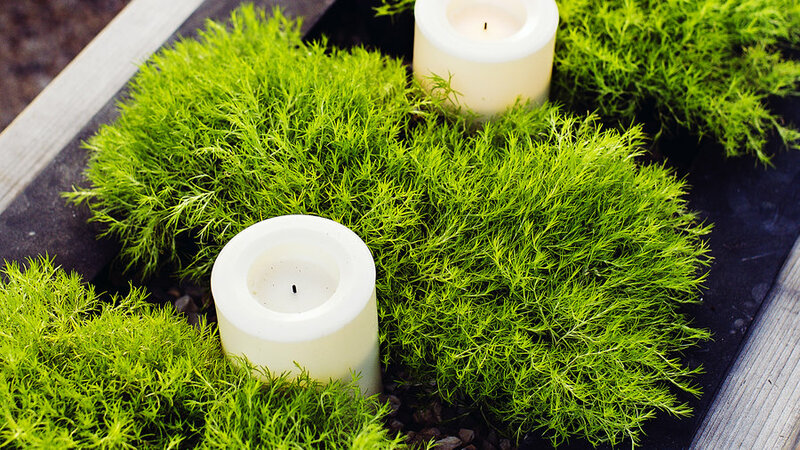 Bands of Irish moss, cut from nursery flats and set into a waterproof metal tray, along with LED candle lights add greenery and glow to the recycled wood table for an evening party. For a more permanent display, fill the tray with crushed taffy gravel to match the floor. 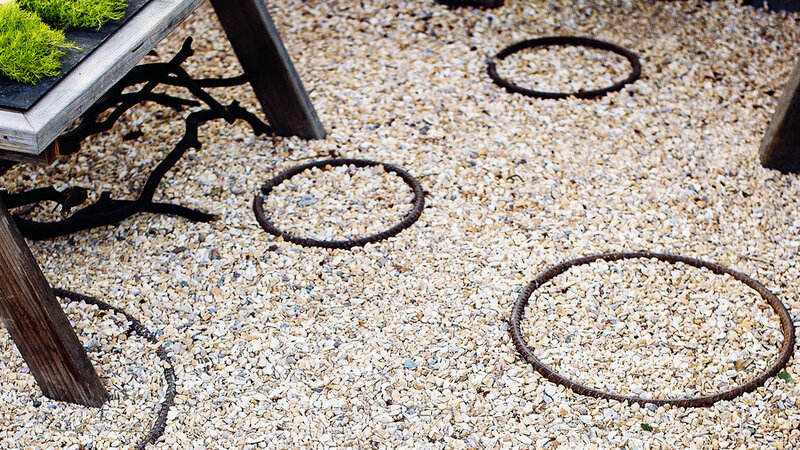 Rebar poles, bent into circles, add playful detailing atop the gravel. (Metal gear wheels or horseshoes could also work for patterning gravel paving.) The 3⁄8-inch crushed taffy gravel’s jagged—not rounded—edges create a stable surface for furniture. 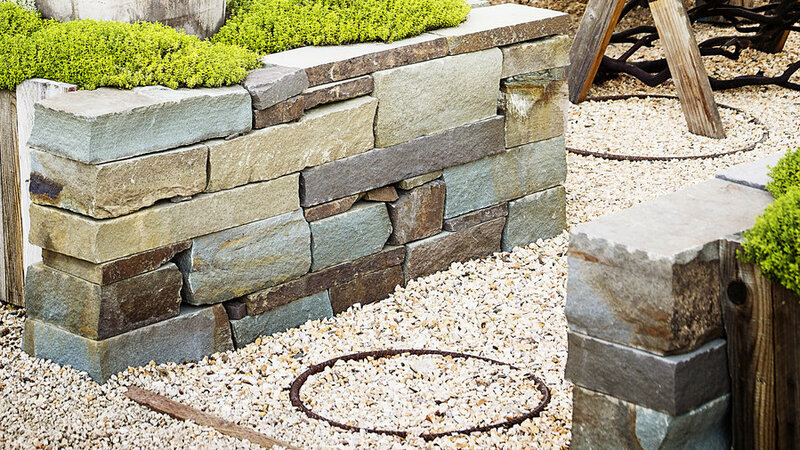 Dry-stacked walls of Connecticut Bluestone offer a cool counterpoint to the gravel and wood. 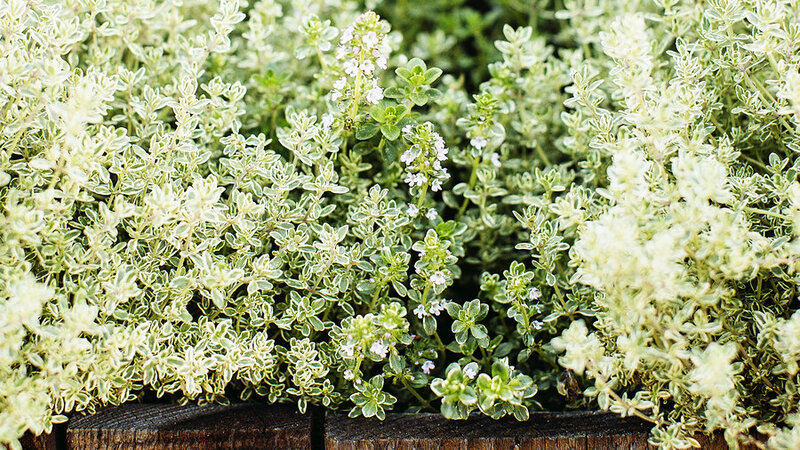 Silvery blue plants, like mounding artemisia ‘Powis Castle’, purple-flowered Russian sage, or succulent groundcover Senecio mandraliscae, offer similar tones.